Following on from the official launch of Inspiring the Future of Theatre last July, this term has seen the first two of the campaign’s regional events. 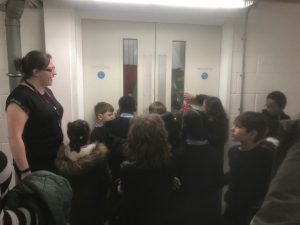 The children of Tredegarville CW Primary in Cardiff and Copdock Primary in Ipswich had the opportunity to meet and talk to employees of a local theatre, discovering the different jobs in the theatre sector both on and off the stage. 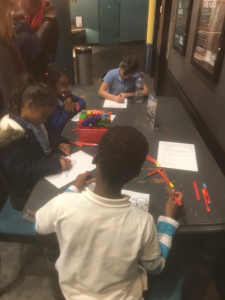 Sherman Theatre in Cardiff welcomed the children of Tredegarville primary to the theatre in October. 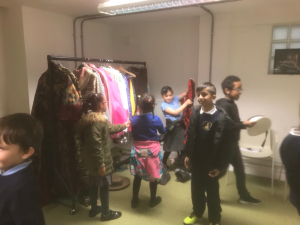 The children received a tour of the theatre, seeing the dressing rooms and sets, before getting the chance to try their hand at some costume design, lighting and sound effects and designing a marketing poster. It was a fantastic morning that opened the children’s eyes to the different jobs in a theatre. 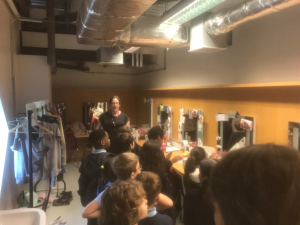 The morning was well received by the children with 100% saying that they would now like to go see a play at a theatre, and several commented that they would now consider a job in theatre from play writer and set design to actor and lighting engineer. The second event saw year 5 and 6 children welcome employees from the New Wolsey Theatre to Copdock Primary. The event began with a ‘panel game’ where the children read five cryptic job descriptions – Head of Creative Learning, Head of Production, Head of Communication, Creative Learning Producer and Agent for Change – and then question the staff to work out what they did. Next a carousel commenced where the children visited each member of staff in small groups to find out more about their jobs and the journeys they took to get where they are. The day concluded with three workshops where the children got to try their hand at drama games and acting exercises, lighting, and creating a marketing campaign. Inspiring the Future of Theatre aims to strengthen connections between schools and theatres. UK Theatre, SOLT and Inspiring the Future are connecting schools and theatres around the country with these regional events. Furthermore, the campaign has seen over 800 Ambassadors from a range of jobs across the theatre sector sign up to Inspiring the Future, meaning schools across the country can now connect with Theatre Ambassadors and arrange events for their students. There are more campaign events to come over the next two terms, with schools continuing to use Inspiring the Future to invite in Theatre Ambassadors to speak to students. If you would like to invite a Theatre Ambassador (or two) to help open your students’ eyes to the exciting future possibilities in theatre, sign up or log in at the top of the page. Work in theatre? Help us to inspire the future generation of theatre goers and employees. Sign up here to become an Inspiring the Future of Theatre Ambassador or visit the campaign page to find out more.